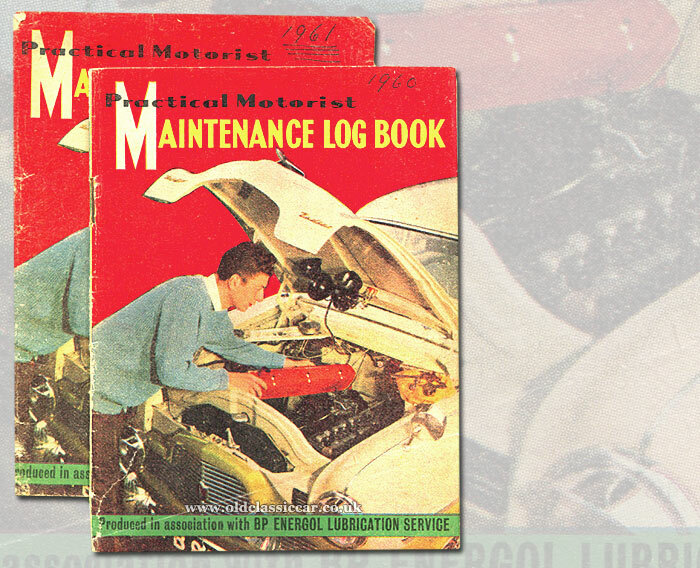 Practical Motorist maintenance log books, 1960 & 1961. Homepage. This page: A couple of original car servicing logbooks published by one of the leading motor magazines. "Practical Motorist" Maintenance Log Books. Car boot sales continue to occasionally turn up the odd interesting item of ephemera, relating to old cars in some way. Two copies of a "Maintenance Log Book", published by Practical Motorist magazine in the early 1960s in association with BP Energol Lubrication Service, caught my eye in March 2018 and were swiftly consigned to my bag. Practical Motorist was a magazine designed with the DIY motorist in mind, both pre- and post-war, with the issues from the 1950s especially featuring particularly attractive artwork on their covers (examples of this title can be found on the Practical Motorist page in the magazines section). The cover of both maintenance logs show a chap, in a suspiciously clean pullover, removing the rocker cover from the straight six engine fitted to his Ford Zephyr Zodiac Mk1. What would he be doing under the rocker cover? Perhaps he was planning to remove the cylinder head, to enable a de-coke of the engine, or maybe he was going to tweak the tappet settings prior to a pleasant drive out in his two-tone Ford. Either way, these two small publications are a reminder that many motorists would while away their weekends beneath the bonnet of their modern(ish) cars, rather than simply wheeling them to the local garage every time something needed doing. Oily hands - and driveways - were the order of the day back then for so many motorists. The original owner of these logs owned an Austin A35, registration 60 DVT. Handwritten entries relating to the Austin commence in March of 1960, the notes reveal that 360 GBP (plus another 100 for tax) was paid for the A35 on the 2nd March. Four gallons of fuel were poured into the tank on week commencing 5th March, after that usually two or three gallons per week were purchased. A new speedometer was installed on the 26th, replacing the old unit that read 20,826 miles at the time of removal. Costs in April related to fuel only, while in May a couple of new wiper blades were sourced. By the end of the month, the new speedo read 1,030 miles. June saw a new filter fitted, plus a set of points and plugs, after which there was a lull in activity bar regular stops for fuel. On the 8th November 1960 a new spot light was fitted, at a cost of just over 4 GBP including fitting. In the new year, January 1961, a new exhaust silencer found its way to the underside of the Austin, while under the bonnet a shiny new water pump was bolted to its 948cc engine. By this time, the Stoke-on-Trent-registered car was three years old, having been registered in February 1958. By the end of January, the mileometer read 4,610 miles. Fuel costs in February would be the final entries in the 1961 logbook, but what happened next? Was the Austin sold on? Was it involved in an accident? Or did the car's owner, who isn't named, simply become more lax in recording his ongoing motoring costs? Who knows. 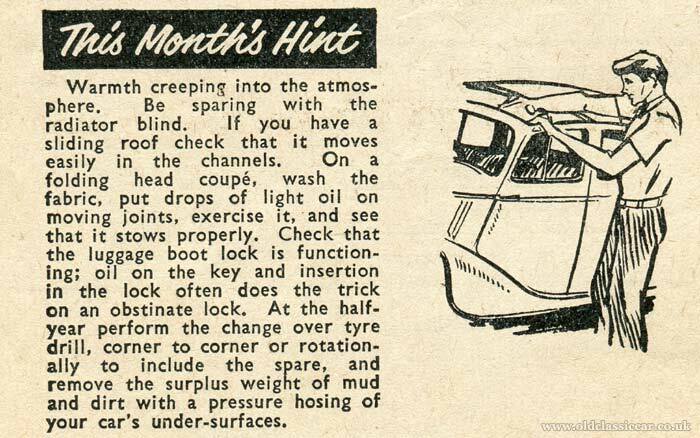 Each month's pages feature a handy hint for the hands-on motorist, reminding them of essential jobs to undertake on their car, and things to check in particular for the time of year. The following entry is for June. More old items relating to motoring can be found in the Motoring Collectables section of the site.